Set in a poor Montréal neighbourhood, the title is French for truffle, that most mysterious, sought after and expensive gastronomic mushroom. In this neighbourhood, they grow beneath the asphalt-covered backyards and the good people have been exploiting their hidden riches for years. But the result of this over-abundance is a dramatic decline in the once astronomical price of truffles to the point where around the world they now can be had for mere pennies. Despite having a gigantic truffle mine just below their Snack Bar, Alice and Charles are struggling to stay in business. Desperate for cash, Charles finds a part-time job to help pay the rent but this new endevour isn’t exactly what it seems to be and soon Alice begins to wonder if Charles is not exactly the man he seems to be. 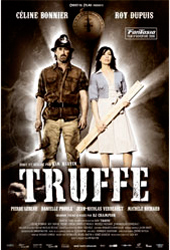 Truffe was selected to be the opening film for the 2008 FanTasia Film Festival in Montréal.